The Zojirushi NS-LAC05XT rice cooker is a great, convenient, option for busy people who don’t want to guess when it comes to cooking rice. Rice, like potatoes is an inexpensive food staple that keeps families fed. Cooking rice without a rice cooker can sometimes be like rolling the dice. Even if you’re a rice expert, it can still be a time consuming process. A rice cooker allows you to make delicious rice the same way every single time. It isn’t a cheaply priced machine (click here to check price), the sleek compact designed Zojirushi NS-LAC05XT rice cooker is a bit of an investment, but if you cook rice often, it is well worth it. Below, I’ve reviewed all of the features of the Zojirushi NS-LAC05XT rice cooker. Read on to see if this is the rice cooker for you. If you’re anything like me, then cooking rice on the stove is iffy. You want mouthwatering rice on demand, but you never know what you’re going to get. Personally, I’ve messed up rice in a variety of ways: sticky rice, under cooked, gummy rice, and my favorite, burnt. The Zojirushi NS-LAC05XT has 3-cup capacity which makes 6 cups of restaurant quality rice. The problem most people have is that they don’t measure properly and they don’t know for how long to cook their rice. The Zojirushi NS-LAC05XT solves this problem with two features: the inner cooking pan, and the MICOM (microcomputer chip). The Inner cooking pan is spherically shaped to distribute heat evenly, it also has convenient measure lines (for water) that are easy to read, something that I would certainly need. The MICOM or microcomputer does all of the heavy lifting for you. Fuzzy logic is what it’s called. It works by constantly adjusting the temperature settings so that you always get perfectly cooked rice every time. This is all controlled by the thermal sensor at the bottom of the inner body of the rice cooker. The control panel has an lcd display that is very easy to use. There are many functions and settings with which you can cook your rice. The buttons are big and obvious. The “timer” button is for, yes you guessed it…setting the time you want your delicious rice to be done by. So let’s say that you want to have dinner ready by 6pm right when you get home from work. You just set the timer using the up and down arrows. Of course, before you use this function, you must set the correct time for it to work. The time is in military time, i.e. 18:30 instead of 06:30pm. The Time setting buttons are up and down arrows used to set the desired amount of time you want your rice cook for. The button labeled “cooking” is used to start the rice cooking cycle. The “Menu” button is used to select different rice cooking options. With this button, you can select the following rice cooking options: Quick cooking, White rice/Mixed, Sushi, Porridge and Brown. To keep track of the rice cooking option you selected, there is a small arrow that appears above the option you selected. The “Keep Warm” is used to keep just cooked rice warm. It’s important to note that this setting is not supposed to be used re-heat cold rice. The “reset” button is used to cancel your recently selected setting. It’s important to pay attention to the settings you choose on your rice cooker. I mention that because it’s something that can be easy to overlook. Each rice type has different cooking times. Also the program runs differently on different cycles. For example the “Sushi” rice setting has the same cook time as “White Rice /Mixed Rice” at 40 to 55 minutes, but the way it’s cooked will be different. 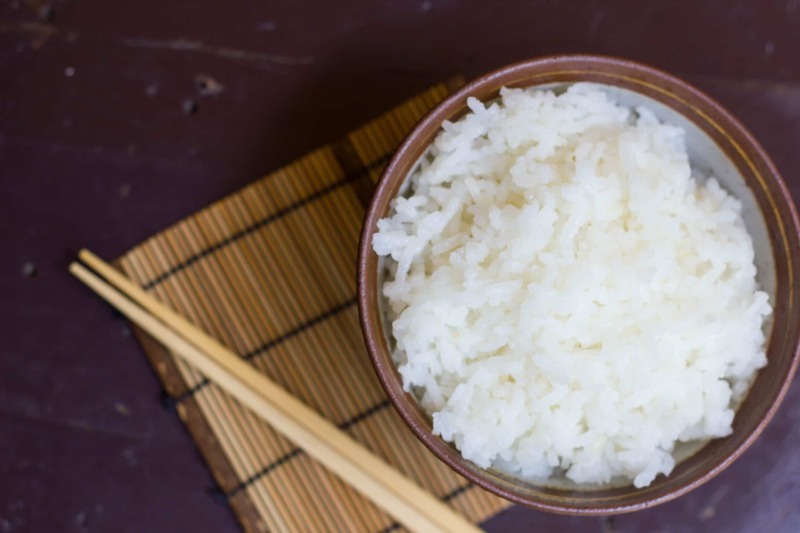 The Quick Cooking setting can get white rice done in as little as 27 minutes, but this rice may be a little harder than if it were cooked longer. Brown rice, with a cooking time of 1 hour and 20 minutes, takes the longest because of the hard bran exterior. Makes sense now, that’s why my brown rice usually came out too hard, I wasn’t cooking it long enough. 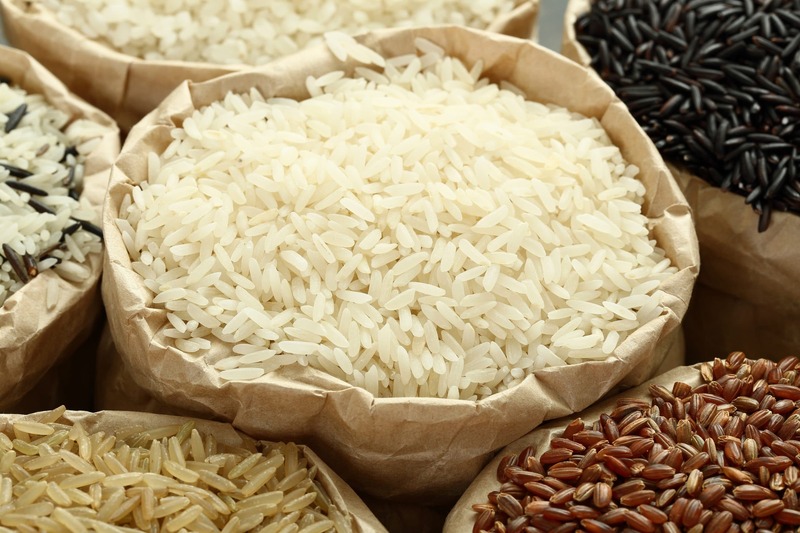 In case you care to know, there are many different types of rice. You’re familiar with brown rice and white rice but you probably didn’t know that white rice comes from brown rice. The name of rice changes depending on the way it was processed. Brown rice is less refined than white rice. Brown rice is rice that still has the Bran. Bran is the hard outer layer that covers unprocessed rice. The manual for the Zojirushi NS-LAC05XT does a good job of explaining the different types of rice. This is important because it affects cooking times. Counter space is a challenge for most people. I always think twice about small appliance purchases because we have a rather small kitchen. Most of our counter space is taken up by permanent residents like our new favorite toy the Vitamix 6300 blender, fruit and vegetable trays, a colander/utensil holder from ikea, etc. When we buy new small appliances for our kitchen, the dilemma for us usually goes like this, “should we put it in the cabinet and forget about it, or make the counters even more crowded”. The Zojirushi NS-LAC05XT is small, so negotiating more counter space should be less of an issue. The measurements are 9-1/8 by 11-7/8 by 7-1/2 inches. The designers really had convenience in mind when they made the Zojirushi NS-LAC05XT. The exterior is clear coated stainless steel which not only makes it durable, but it also makes it easy to clean (and good looking). The inner lid is detachable for easy cleaning. The cord is retractable so it can be stored easily. The Zojirushi NS-LAC05XT has 3 accessories. The spatula is designed for this rice cooker to avoid damaging the non-stick coated inner pan. There is ls also a spatula holder to avoid making a mess on your countertop. You must use the included measuring cup. Other measuring cups won’t work and this will throw off your recipes. Cleaning the Zojirushi NS-LAC05XT is simple. All parts that will need regular cleaning are easily removed. Simply wipe the exterior with a soft sponge rag. Do not use any harsh cleaners like bleach to clean the inner pan as these may damage the Teflon coating. Use a non-abrasive rag or sponge to clean the inner pan. The inner lid can be cleaned like you would your other dishes. This isn’t the most expensive kitchen appliance, but it is certainly not cheap. 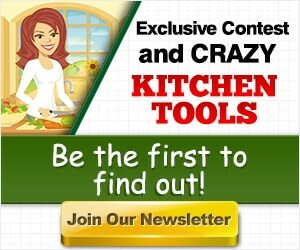 I prefer to buy appliances with a great warranty like with Vitamix. The warranty for the Zojirushi NS-LAC05XT is a standard 1-year manufacturer’s warranty. Zojirushi does not cover shipping fees. This product seems to be pretty durable. In my research, I didn’t find any consistent issues that stood out to me. But there will always be complaints, but I didn’t come across any apparent defects that crop up over and over again, none that would prevent me from buying. Customer service for a rice cooker is probably only going to be an issue if there is a problem with your unit. So naturally, you would want to know what it’s like to call the customer service line. The customer service number is 1-800-733-6270. I’ve come across many reviews from customers that were happy with their Zojirushi NS-LAC05XT. There were also some complaints, but nothing that I found that would scared me off of this product. For some users, discovering the Zojirushi NS-LAC05XT was serendipity. “Restaurant quality rice”, is what some stoked customers said about their experience with this rice cooker. Other reviewers compared their experiences between the Zojirushi NS-LAC05XT to that of “cheap” rice cookers. There was no comparison. The cheap rice cookers scorched the bottom of the inner pan and the water boiled over. Other reviewers considered cheaper alternatives but arrived at the universal truth; you get what you pay for. 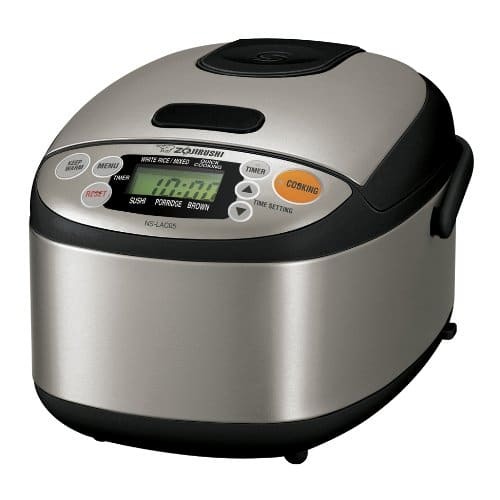 For serious cooks, a few customers thought this is the entry level rice cooker. Some reviewers whom ranked the Zojirushi NS-LAC05XT highly, touted the brand name as a true representation of quality. Reviewers use this device to make other cereals too. Some users make steel-cut oatmeal, grits, and cream of wheat. Some even use this machine to make lentils. Convenience seems to be the biggest advantage in this machine. For busy people, there just isn’t enough time to prepare a fresh meal every day. Some reviewers uses this rice cooker to make oatmeal (porridge setting) in the mornings and brown rice for dinner. Brown rice can take nearly 2 hours to fully cook, so you can see how this rice cooker can really come in handy. I came across reviewers who love brown rice and there is a bit of difference between brown and white rice. Taste is not the only difference, more importantly is the nutritional value of brown rice. Unfortunately, because of the difference in time needed to prepare brown rice, most people opt for white rice. This rice cooker will help you to consistently and easily prepare brown rice. There are lots of customers whom use this cooker mainly for brown rice. Owners of “old-school” rice cookers are happy they no longer have to deal with the mess that comes with the glass top rice cooker. One over-the-top reviewer said she was going to get a tattoo of “Zojirushi” on her shoulder blade. We looked beyond the superficial negative reviews to determine if maybe there were some underlying issues with this rice cooker. One issue that was complained about more than once was that the Teflon coated heating pan started to peel. There were other critics that pointed to inconsistent performance, hard to understand instructions and even taste. The Teflon issue can be a cause for concern, but it has been deemed safe, according to some sources. Okay, so even if it is safe, you still don’t want it in your food, right? I don’t blame you. I do however, offer this, when Sarah and I got our first set of non-stick pans, we would use forks, knives, and other abrasive utensils on these pans and of course we damaged them. Since then, we’ve purchased non-stick pans from varying places (and price ranges), and they don’t wear out prematurely because we don’t abuse them. Perhaps some reviewers don’t know what utensils are safe to use on non-stick surfaces. Over time, the Teflon coating will wear out and peel, a solution is to buy a new inner pan. Another complaint was that the instructions are hard to understand. I understood them fine. After reading through more reviews though, it does seem as though the directions miss a few points. For example, some have complained that the measuring line for water on the inner pan does not state whether the line is for just the water or the water plus rice. The instruction manual does not address the concern. To the rice cooking challenged, like yours truly, the Zojirushi NS-LAC05XT rice cooker is a nice solution for couples or a small family of 3-4. It’s not the most expensive rice cooker, but it’s not a cheap one either. It’s a small investment, but the Zojirushi brand is recognized as one of, if not the best rice cooker manufacturer. It’s not just about not being able to cook rice properly. Rice cookers also serve as a function in convenience. Imagine coming home and just as you turn the key to your door, your rice cooker starts playing a little jingle. Done. Rice cooked to perfection with no hassle. I love appliances that are practical and can easily justify a space on my counter. The manual is pretty straight forward, and it even includes some recipes, and parts numbers for convenient part replacement if ever necessary. There are a few concerns, and no product is without flaws, but the Zojirushi NS-LAC05XT Micom rice cooker is in my opinion a good buy.